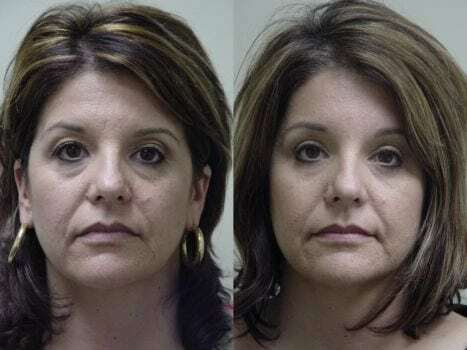 Botox has been hailed as a miracle by some people for the ability to help stop creases and pleating of the skin in the upper face by temporarily halting the muscles that do the folding. However, Botox cannot help a person with drooping eyebrows and a permanently wrinkled forehead. 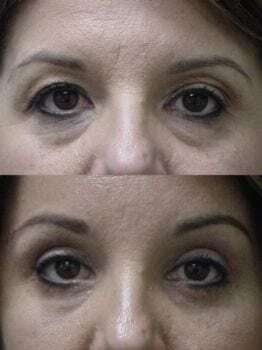 In this situation, a patient may choose to undergo a brow lift. Also called a forehead lift, this surgical procedure involves the removal of excess tissue, adjustment of muscles, and tightening the forehead skin. An endoscope, a small tube with a small fiber-optic camera, is used to minimize scars that are hidden in the hairline. Dr. Batra understands each brow lift patient has a different anatomical structure and needs. 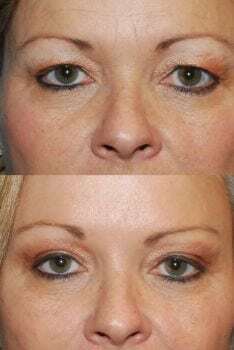 Your brow lift needs are specific, which why it is important to schedule an appointment to obtain a free consultation to see what can be done for you. 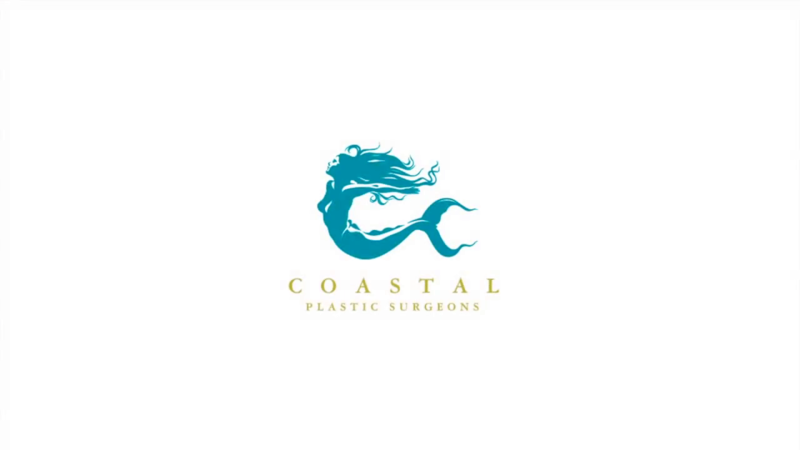 Coastal Plastic Surgeons will find you an attractive and aesthetically pleasing outcome. Coastal Plastic Surgeons is composed of renowned plastic surgeons in San Diego and Temecula. They deliver remarkable yet natural-looking aesthetic results. Their impeccable reputation attracts numerous otoplasty, eyelid surgery, brow lift, facelift and rhinoplasty patients every year. If you would like to obtain more information about these treatments, please view the respective pages. 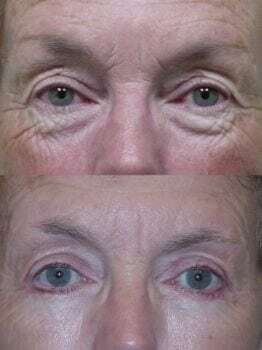 This woman was interested in having revision to her upper and lower eyelids. She felt that the bags in her lower eyelids made her appear tired all of the time. 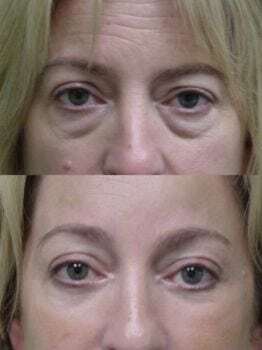 Upper and lower lid blepharoplasties were performed. The recovery time for this patient was approximately seven days. The post-operative photograph was taken six months after surgery. Overall, the bags are much improved and her upper eyelids appear more refreshed. This patient is very happy with her outcome. This patient felt that her eyes were, “heavy” and appeared closed. She desired rejuvenation in the appearance of her eyes. Due to her brows being low, we opted to perform an endoscopic brow lift. The endoscopic lift is performed through a camera and scope in a small incision at the top of the scalp. We were able to open up the area of her eyes adequately and also removed the extra skin from her upper and lower eyelids and from the fat pads. 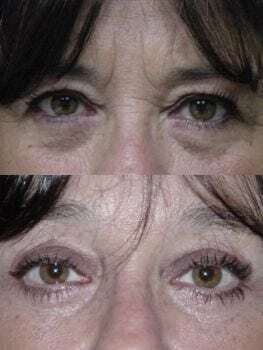 This patient wanted improvement in the appearance of her eyelid areas. Upper and lower eyelid blepharoplasties were performed, which opened up her eyes. This photograph was taken one year after surgery. This patient was most concerned with the bags underneath her eyes. 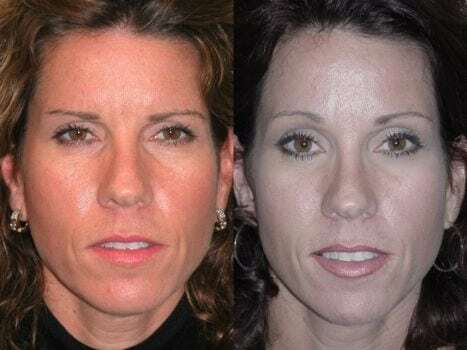 She underwent lower lid blepharoplasty. No scars are seen in the lower eyelids, as the procedure is performed from inside the eyelid. This technique is known as a transconjunctival lower lid blepharoplasty. This patient is an elderly female with a lot of sun damage, as well as natural aging around the eyelids. 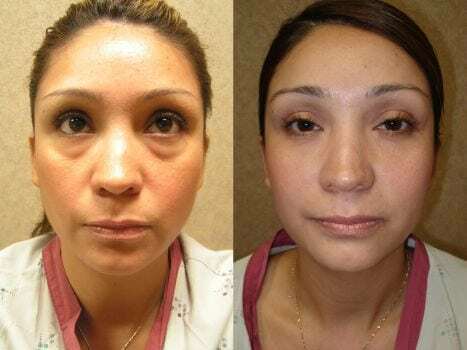 Blepharoplasties were performed to the upper and lower eyelids with removal of some of the fat pads. You can see a very nice result in the post-operative photograph taken one year after surgery. Overall, she is very happy with her outcome. This Native American patient had extremely heavy eyebrows and was very menacing in appearance. 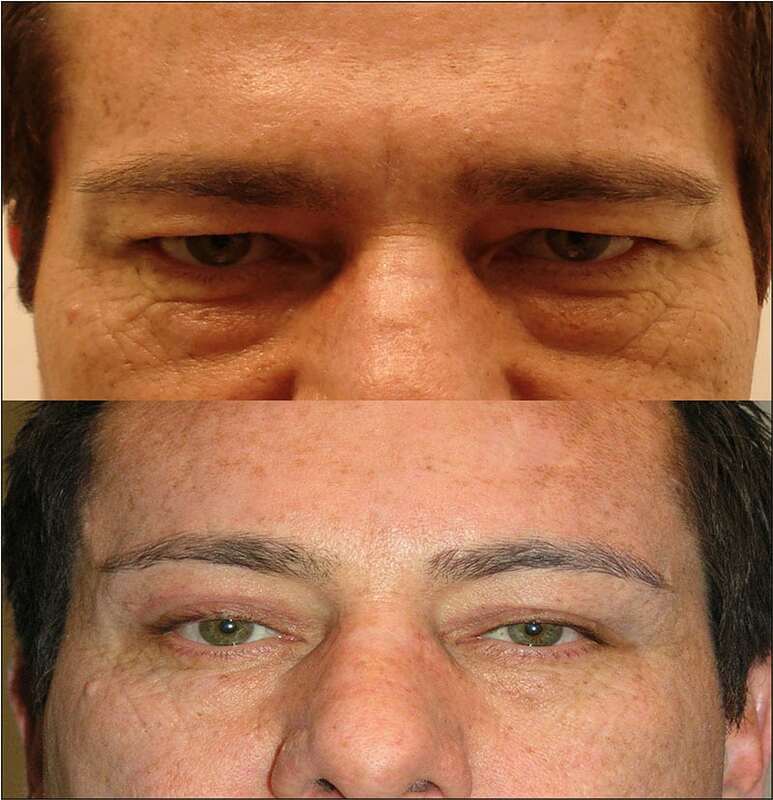 He underwent an endoscopic brow lift, as well as doing his upper and lower eyelids. Overall, it has opened his eyes up nicely and he is very happy with his outcome. This is a Persian woman who felt that her upper eyelids were too heavy. She also did not like the appearance of bags underneath her eyes. 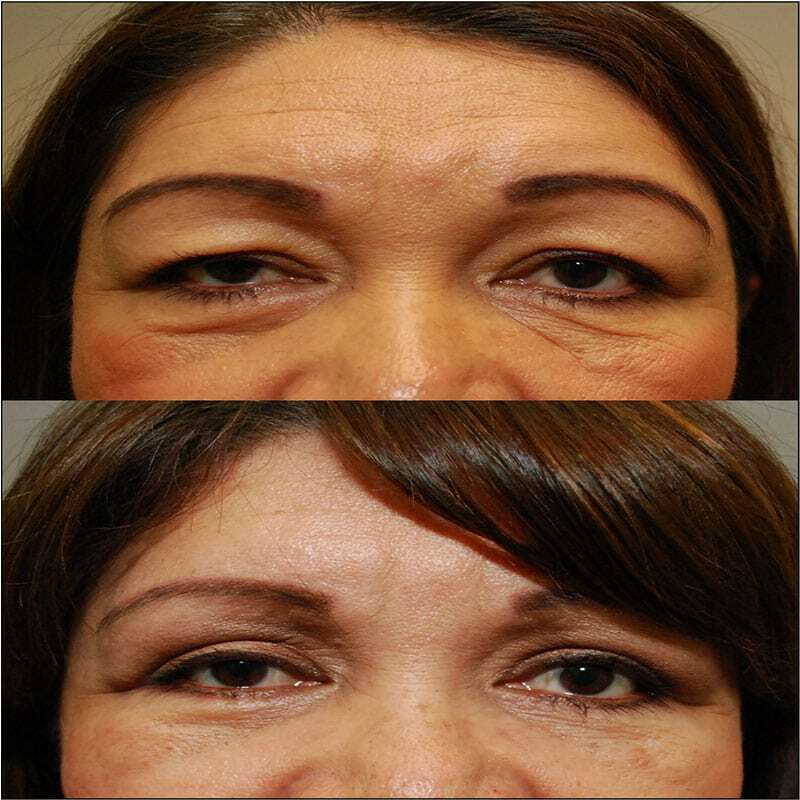 Upper and lower lid blepharoplasties were performed to rejuvenate her eyes. The total time required for this type of procedure is approximately 60 to 90 minutes with a recovery time of approximately one week. 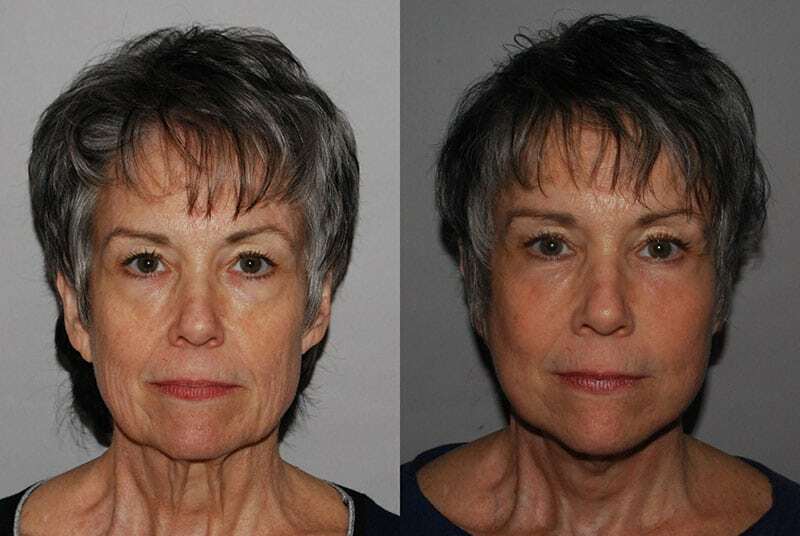 This patient underwent an endoscopic brow lift, as well as an upper lid blepharoplasty. As you can see, his eyes appear more open and he looks rejuvenated. This patient underwent an upper lid blepharoplasty performed in the office. This procedure can be performed in an office setting under local anesthesia. As you can see in the post-operative photograph, her eyes are rejuvenated. Her eyebrows were already in good position and she did not require a brow lift. This patient underwent an endoscopic brow lift, as well as upper and lower lid blepharoplasties. Post-operatively, you can see that her eyes are more open. Notably, she does not appear over-pulled or overcorrected. Overall, she is very happy with her outcome. 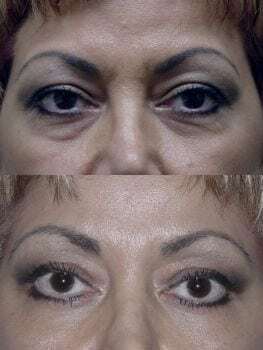 This Persian woman wanted upper and lower lid blepharoplasties. The procedure took approximately 60 minutes. The post-operative photograph is taken one year after surgery, and, once again, this is a very nice outcome. This patient is 23 years old. She started to have premature aging of her lower eyelids, which made her appear older than her natural age. The fat pads were removed from her lower eyelids through an incision inside the lid, so no scars could be seen. 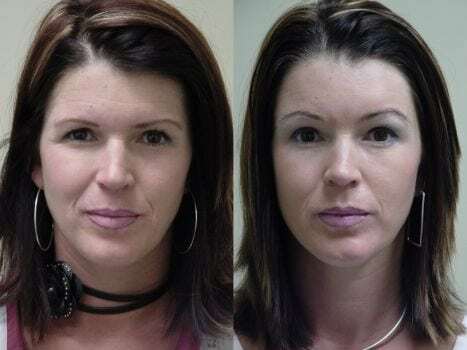 This photograph was taken one year after surgery and you can see she has a very nice outcome. This patient obviously has large fat pads in her lower eyelids. The fat pads were removed from an incision inside the eyelid, without removal of any skin. The post-operative photograph was taken three months after surgery and shows a very nice outcome. 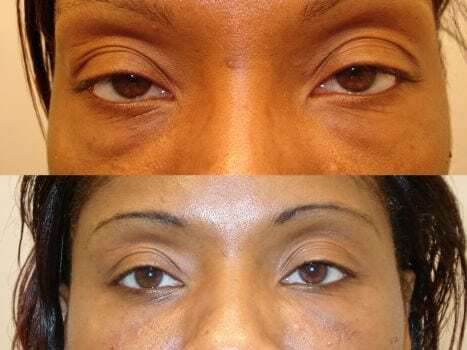 This African American female wanted improvement in the extra skin of her upper eyelids, as well as taking care of the excess fullness in her lower eyelids. She underwent a procedure, which removed the extra skin of her upper eyelids and we were also able to take the protruding fat out of her lower eyelids without a scar on the eyelid. As you can see, she has a scarless outcome and once again, this patient is very happy with her outcome. This picture was taken a year after her surgery. This patient underwent removal of the fat bags in her lower eyelids. She has a pleasing appearance to her brows and upper eyelids. 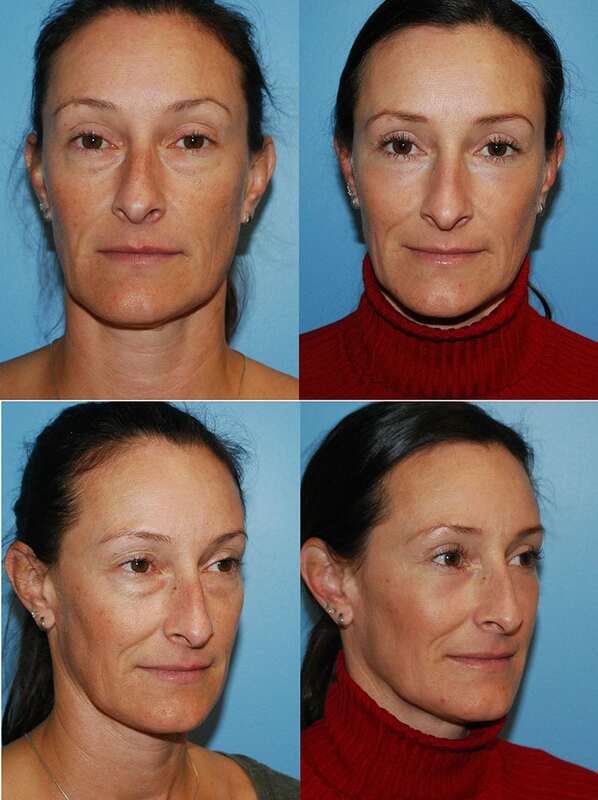 As you can see, removal of the excess fat in the lower eyelids has taken a good 7-10 years off of this patient’s face. The procedure takes about 1 hour. This patient felt that her eyes made her look angry all the time. She underwent an endoscopic brow lift and has a very pleasing appearance to her eyebrows. It opened up her eyes adequately and makes her appear to be less stressed. This patient wanted improvement in her eyebrow appearance. She underwent an endoscopic brow lift, which placed her eyebrows in a good position. The main concern for people undergoing endoscopic brow lift is that they do not look overcorrected or appear to look surprised. 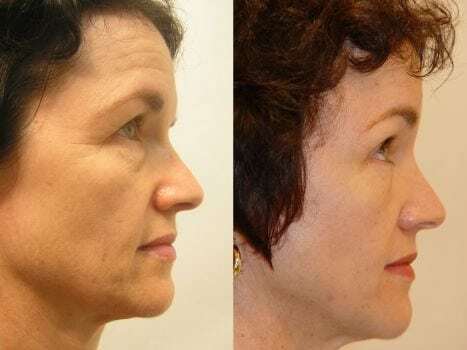 As you will see throughout the pictures in this section, none of the patients look as if they are surprised and look appropriately rejuvenated. 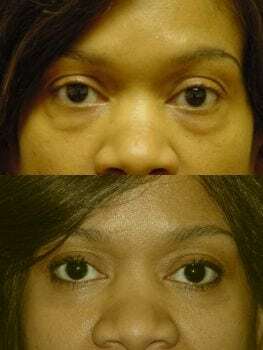 This patient underwent excision of the extra skin of her upper eyelids and removal of the fat bags to her lower eyelids. She did not require a brow lift. 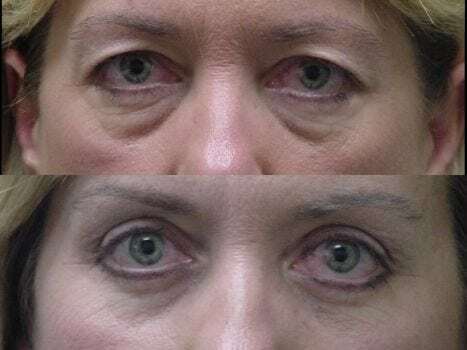 Once again, she has a fair amount of asymmetry between her eyes and this asymmetry persists, but overall, the extra skin of the upper eyelids and the fat bags in the lower eyelids have been removed. This 32-year-old was concerned about the fat bags in her lower eyelids. In a 45-minute procedure, the fat bags were removed without any scars on her eyes. This procedure is called a transconjunctival blepharoplasty. She was able to return to work in 5 days. 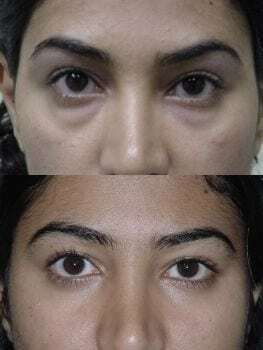 This picture shows you the typical side view of a patient who has had an endoscopic brow lift, as well as removal of the extra skin of her upper eyelids and removal of the fat bags of the lower eyelids. 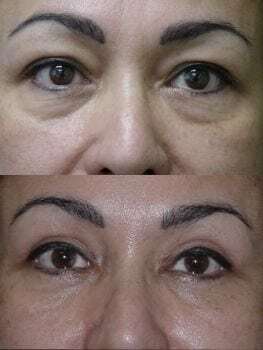 The patient had an extremely difficult situation with very heavy brows, very heavy eyelids on both the upper and lower eyelids. 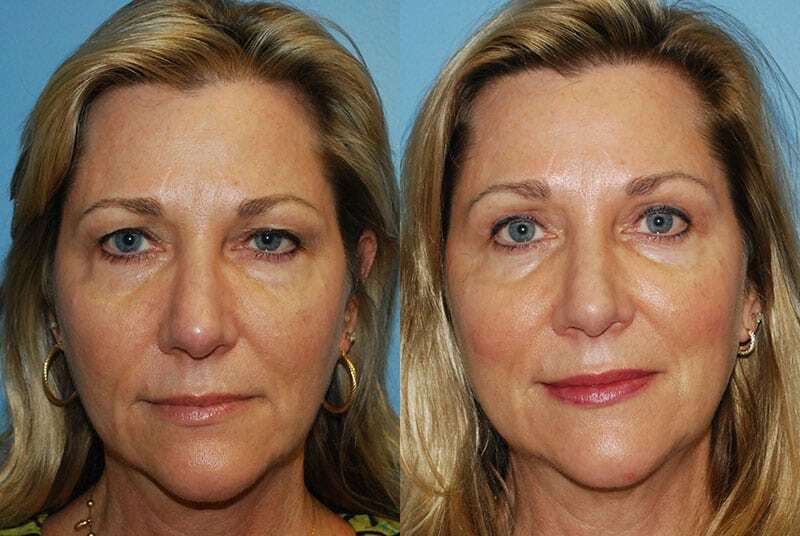 She underwent an endoscopic brow lift, as well as an upper and lower lid blepharoplasty. In addition, she underwent a procedure called a canthopexy to support her lower eyelids in an appropriate position. While her eyes still look somewhat heavy, she has been corrected adequately without making her look surprised or like a different person.